ROADTRIP!!! The Warriors are loading up the cars and headed to Madtown for what is bound to be yet another GREAT game. The ‘Cats, despite being 10 point underdogs, head in to Camp Randall as the sole ranked squad as both teams look to avoid an 0-2 start in Big Ten play. This is a crucial game for the #B1GCats, and hopefully the Warriors can help bring home a W! Now to the picks! Game Summary: For this edition of Prediction Friday I will show my reactions to the action using only gifs. Let the fun begin! Game Summary: I would never have predicted NU to win at Wisconsin prior to last week; however, despite our loss, we proved that we’re plenty capable of playing with the big boys. Having said that, there were some glaring weaknesses (namely our run defense) that will surely be difficult to overcome this week. My prediction for an NU win is a combination of the fact that I think NU is legitimately good, but also that I’m not sold on Wisconsin. They’ll be able to run the ball on us… no doubt, but quite frankly I don’t see Abredarais (or however the hell you spell that guy’s name) having the same success against us as he did against Ohio State. As it turns out, OSU’s secondary is not very good. I see us competing similarly to last week, but actually holding on in this one. Siemian, again, will be more successful at quarterback than Colter, and Venric Mark will have a solid day against a slightly less athletic defense. We’ll be up by 10 at the half… extend it to 13 in the 4th and hold on after a late Wisconsin score. Player to Watch: Kain Colter. How will he be used offensively? I suspect we won’t see too much read option, but I do think he might have a big day as a receiver. Game Highlight: The small contingent of NU fans, including yours truly, doing a combination of Jump Around and Put Your Hands Up In The Air at the end of the 3rd quarter when we’re up by 13. Game Summary: All year long I’ve predicted a loss to Wisconsin, so I’m going to stick to that now. A loss here would put our Legends Division title hopes on life support, so I really hope I’m wrong. I think Wisky will be able to run on us all day, and that will be their gameplan. Run for 4 yds a pop every time, eat clock and keep our offense off the field. Then, once they’ve lulled us to sleep with the run game, they’ll test our secondary deep with Abbrederis. I see Northwestern actually getting out to a quick start in this one, in front of a raucous Badger crowd. Trevor takes us down the field with Kain at WR for an early 7-0 lead. However, Wisconsin roars back behind Melvin Gordon, who bursts free for a 65 yd TD run. That Gordon kid is special, and just as dangerous as Ricky Football. To win this game we’ll need to do what we didn’t against OSU last week – convert TDs in the red zone instead of FGs. I think we’ll move down the field easily in this game through the air, but again won’t be able to put the dang ball in the end zone, and make those crucial plays when we need them. I think this will be tight throughout, and come down to whoever has the ball last. A late FG wins it for the Badgers – 31-30. Game Summary: Well…before I get to anything I want to repost what we found at the OSU cleanup yesterday in the van. Just another alert – if you are looking for a (slightly used) pair of boxer briefs, DM US! Yes, Carlos Hyde had his way with the ‘Cats defense. But, as you may or may not have noticed, Carlos Hyde is the size of most of the ‘Cats’ linebackers, if not bigger. He slammed it down their thoats (lolz) time and time again. That’s not Wisconsin’s game. They’re more of an East-West running team. More built on speed and finesse. I think that’ll be a little easier for Northwestern to stop. Gordon will get his, but the Badgers will not run for 250 yards on the ‘Cats like the Buckeyes did. 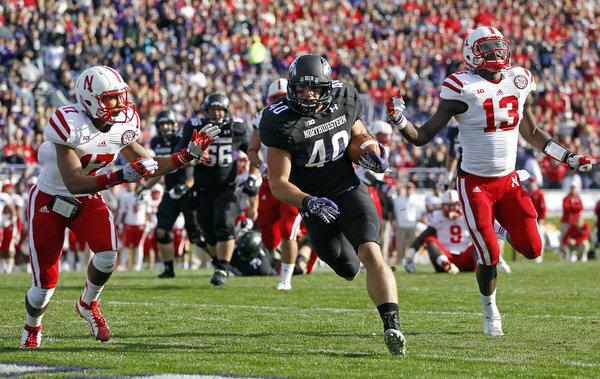 Additionally, Joel Stave is no Braxton Miller, and the #B1GCats made Miller look human last week. I think the winning game plan for Northwestern lies in letting Stave beat you with someone not named Jared Abbrederis (sp?). On the offensive side, I really don’t see Northwestern having too much difficulty moving the ball against Wisky. I think we’ll see a decent amount of Trevor in the huddle leading a passing attack through Wisco’s secondary, which is more vulnerable than the run defense. Stay away from Borland PLZ. Rashard Lawrence broke out last week as yet another option downfield alongside Vitale and the Joneses. With so many options in the WR corps, I see a big day for Trevor. Now, each team just lost a heartbreaker to OSU. The intangible issue here is how each responds. From all I’ve heard this week, I think the ‘Cats are in a good mindset and ready to take out some frustration on the Badgers. Now, the Badgers are about 99659460-3 in the past few years at Camp Randall. So, despite the fact that I think NU has the better overall team (they do), the atmosphere will level the playing field a little bit. NU jumps out to an early lead on the first drive with a Colter-to-Jones (pick one) TD. The ‘Cats stymy Wisco on their first drive and out of nowhere are up 14-0. The game stalls for a while before Wisconsin scores before half to cut the lead to 7. The second half is all offense, no defense as these two trade off scoring drives. A 4th Q Stave interception all but seals the game. A garbage time Wisconsin TD makes the game look like a nailbiter, but the ‘Cats prevail. Finally, Paul has a little nugget for us to consider, “Badger will see his shadow. 3 more months of losing for Wisco.” Thanks Paul. That’s it from us. Look for the Warriors on ABC/ESPN2 and hopefully we can bring everyone home a W!